Wednesday of last week (September 23) there was a major breakthrough for the peace process between the Colombian government and the FARC (Revolutionary Armed Forces of Colombia). There was much anticipation as President Juan Manual Santos announced he would be traveling to Havana, Cuba (where the negotiations have been taking place) at the same time as “Timochenko” (the highest leader of the FARC) was going to be travelling to Cuba. It turned out they were both going to Cuba to sign a final negotiated agreement on one of the most difficult points of the negotiations, that of transitional justice, which had been blocking the peace process from continuing for over a year. Transitional justice is an approach to achieving justice in times of transition from conflict and/or state repression. It is not an ordinary approach, but a temporary justice system to assist a society to transition from war/conflict to peace. Coming to this agreement seems to have pushed the peace process across the 'point of no return' as the government and the FARC announced they would be signing a final peace accord in no more than six months. Colombian President Juan Manuel Santos (left), FARC leader "Timochenko" (right) and Cuban President Raul Castro (middle) shaking hands for the agreement. Photo - EFE. Although there are those that say the agreement will allow for impunity of the FARC rebels, the chief prosecutor of the International Criminal Court (ICC), Fatou Bensouda, has welcomed the agreement on transitional justice. This gives strong legitimacy to the agreement as the ICC, if not happy with the agreement, could decide to step in to try both FARC members as well as members from the national army and political leaders of Colombia in the Hague. This would have caused great damage to the agreements negotiated between the FARC and the government. Fortunately the process can continue with the support of the ICC. "I note with optimism that the agreement excludes the granting of amnesty for war crimes and crimes against humanity, and is designed, amongst others, to end impunity for the most serious crimes," Besnouda said. There is no other peace process in the world where victims have occupied such a central role. We have here a design for transitional justice that is historic and innovative. It gives priority to truth-telling, but does not eschew the need for justice. The model is innovative in its inclusion of restorative justice and its focus on repairing the damages inflicted on individuals and communities through a process of dialogue and healing. This bears watching as it could provide new models for other conflict zones seeking to find a way out of war. 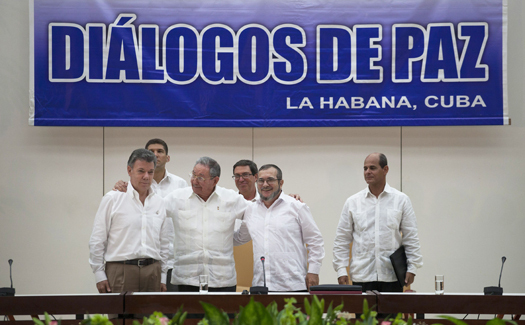 Colombian President Juan Manuel Santos and FARC leader Timochenko announce the agreement on criminal responsibility on September 23, 2015 in Havana, Cuba. Photo - Government of Colombia. As important as this step towards the final signing of a peace accord, as I have mentioned before, the signatures on that final document will not automatically mean peace to the Colombian people still living with the numerous consequences of over 50 years of armed conflict. The process after the accord will be long and arduous to build an empowered and participatory society based on respect for human rights. The Lutheran Church of Colombia (IELCO) is positioned to play an integral role in this long process. It is quite an honor to have the opportunity to be working in such a capacity in such a critical time of Colombia's history. As The IELCO is beginning to plan its activities for the year 2016, it is very exciting to imagine the numerous and varied ways it can be involved in peace-building and human rights work. Through many conversations with pastors and members of The IELCO, I have gained a much clearer understanding of the possibilities there are for me to assist the church to live into its prophetic role working for justice and peace.